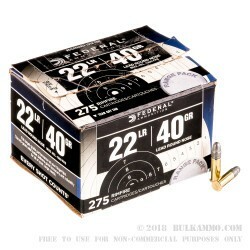 Federal Ammunition’s 22 LR rounds are optimized for AR-15 style and other semi-automatic firearms, including Ruger 10/22 rifles, by promoting smooth feeding while minimizing misfiring, jamming, and the accumulation of lead and powder residues. 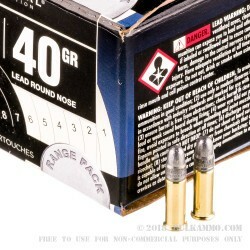 This round’s 40 grain lead round nose bullet is suitable for varmint hunting because of its larger surface area that delivers relatively great energy upon impact, high muzzle velocity of 1,200 fps, and excellent penetration performance. It is furthermore a fine round to use for training because of its low price and all-around versatility. 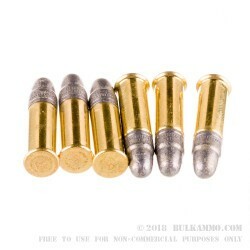 This non-corrosive round’s rimfire brass casing with Boxer-primer is a good example of Federal’s commitment to the production of high-quality ammunition. The Minnesota-based manufacturer has emphasized innovation and advanced technology in all of their products since their foundation in 1922, and as such owes their now enormous success to the trust they have established with hunters and shooting enthusiasts throughout the United States.